, a very learned writer, and famous for his skill in the oriental languages, was born at Zurich in Switzerland, in 1620. He had a particular talent for learning languages; and the progress he made in his first studies gave such promising hopes, that it was resolved he should be sent to study in foreign countries, at the public expence. He began his travels in 1638, and went to Geneva, where he studied two months under Fr. Spanheim. Then he went into France, and thence into Holland; and fixed at Groningen, where he studied divinity under Gomarus and Alting, and Arabic under Pasor. Here he intended to have remained; but being very | desirous of improving himself in the oriental languages, he went in 1639 to Leyden, to be tutor to the children of Golius, who was the best skilled in those languages of any man of that age. By the instructions of Golius, he improved greatly in the knowledge of Arabic, and also by the assistance of a Turk, who happened to be at Leyden. Besides these advantages, Golius had a fine collection of Arabic books and Mss. from which Hottinger was suffered to copy what he pleased, during the fourteen months he staid at Leyden. In 1641, he was offered, at the recommendation of Golius, the place of chaplain to the ambassador of the States-general to Constantinople; and he would gladly have attended him, as such a journey would have co-operated wonderfully with his grand design of perfecting himself in the eastern languages: but the magistrates of Zurich did not consent to it: they chose rather to recall him, in order to employ him for the advantage of their public schools. They permitted him first, however, to visit England; and the instant he returned from that country, they appointed him professor of ecclesiastical history; and a year after, in 1643, gave him two professorships, that of catechetical divinity, and that of the oriental tongues. He married at twenty-two, and began to publish books at twenty -four. New professorships were bestowed upon him in 1653, and he was admitted into the college of canons. In 1655, the elector Palatine, desirous to restore the credit of his university of Heidelberg, obtained leave of the senate of Zurich for Hottinger to go there, on condition that he should return at the end of three years: but before he set out for that city, he went to Basil, and took the degree of D. D. He arrived at Heidelberg the same year, and was graciously received in that city. Besides the professorship of divinity and the oriental tongues, he was appointed principal of. the Collegium Sapientia?. He was rector of the university the year following, and wrote a book concerning the re-union of the Lutherans and Calvinists; which he did to please the elector, who was zealous in that affair: but party-animosities rendered his performance ineffectual. Hottinger accompanied this prince to the electoral diet of Francfort in 1658, and there had a conference with Job Ludolf. Ludolf had acquired a vast knowledge of Ethiopia; and, in conjunction with Hottinger, concerted measures for sending into Africa some persons skilled in the oriental tongues, who might make | exact inquiries concerning the state of the Christian religion in that part of the world. 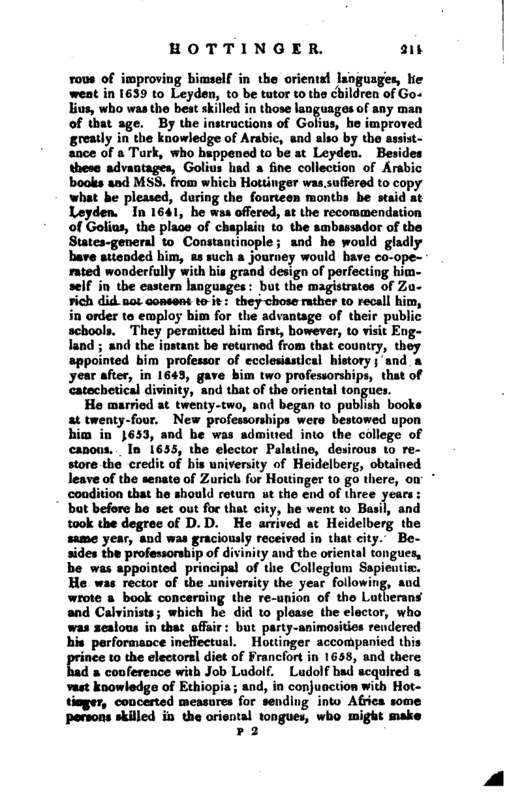 Hotiinger was not recalled to Zurich till 1661, his superiors, at the elector’s earnest request, having prolonged the term of years for which they lent him: and he then returned, honoured by the elector with the title of Ecclesiastical-counsellor. Many employments were immediately conferred on him: among the rest, he was elected president of the commissioners who were to revise the German translation of the Bible. A civil war breaking out in Switzerland in 1664, he was sent into Holland on state affairs. Many universities would willingly have drawn Hottinger to them, but were not able. That of Ley den offered him a professorship of divinity in 1667; but, not obtaining leave of his superiors, he refused it, until the magistrates of Zurich consented, in complaisance to the States of Holland, who had interested themselves in this affair. 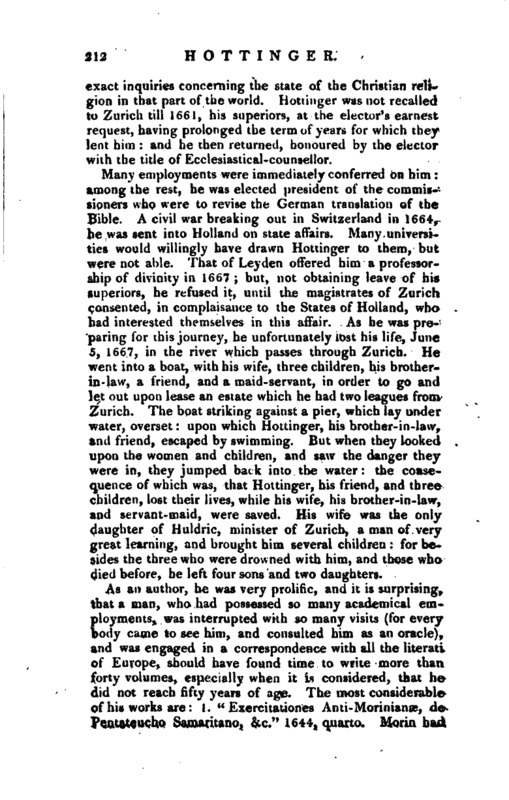 As he was preparing for this journey, he unfortunately lost his life, June 5, 1667, in the river which passes through Zurich. He went into a boat, with his wife, three children, his brotherin-law, a friend, and a maid-servant, in order to go and let out upon lease an estate which he had two leagues from Zurich. The boat striking against a pier, which lay under water, overset: upon which Hottinger, his brother-in-law, and friend, escaped by swimming. But when they looked upon the women and children, and saw the danger they were in, they jumped back into the water: the consequence of which was, that Hottinger, his friend, and three children, lost their lives, while his wife, his brother-in-law, and servant-maid, were saved. His wife was the only daughter of Huldric, minister of Zurich, a man of very great learning, and brought him several children: for besides the three who were drowned with him, and those who died before, he left four sons and two daughters. 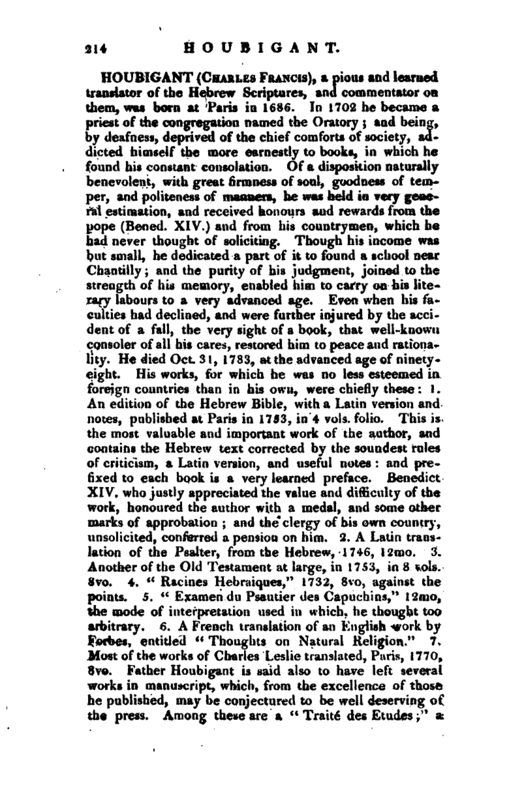 As an author, he was very prolific, and it is surprising, that a man, who had possessed so many academical employments, was interrupted with so many visits (for everybody came to see him, and consulted him as an oracle), and was engaged in a correspondence with all the literati of Europe, should have found time to write more than forty volumes, especially when it is considered, that he did not reach fifty years of age. The most considerable of his works are: 1. “Exercitationes Anti-Morinianse, de Pentateucho Samaritano, &c.” 1644, quarto. Moriti had | asserted, in the strongest manner, the authenticity of the Samaritan Pentateuch; which he preferred to the Hebrew text, upon a pretence that this had been corrupted by the Jews and it was to combat this opinion, that Hottinger wrote these Exercitations. 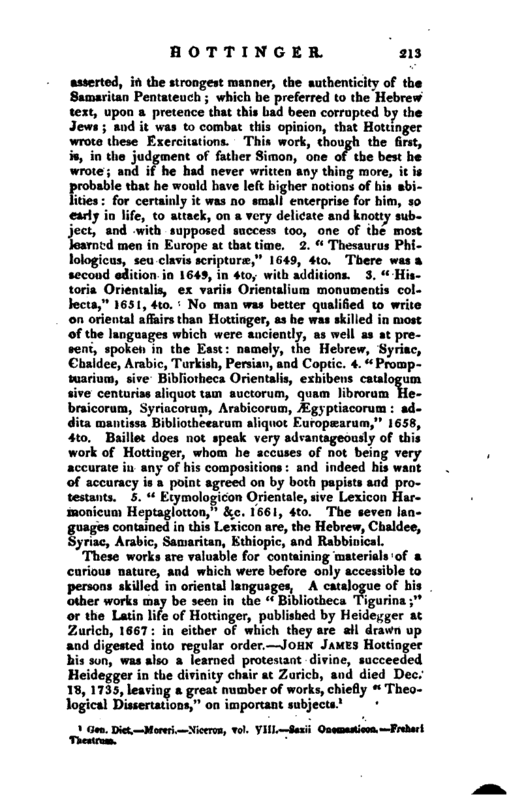 This work, though the first, is, in the judgment of father Simon, one of the best he wrote; and if he had never written any thing more, it is probable that he would have left higher notions of his abiJities for certainly it was no small enterprise for him, so early in life, to attack, on a very delicate and knotty subject, and with supposed success too, one of the most learned men in Europe at that time. 2. “Thesaurus Philologicus, seu clavis scripturic,” 1649, 4to. There was a second edition in 1649, in 4to, with additions. 3. “Historia Orientalis, ex variis Orientaliuin monumentis collecta,” 1651,4to. No man was better qualified to write on oriental affairs than Hottinger, as he was skilled in most of the languages which were anciently, as well as at present, spoken in the East: namely, the Hebrew, Syriac, Chaldee, Arabic, Turkish, Persian, and Coptic. 4. “Promptuarium, sive Bibliotheca. Orientalis, exhibens catalogum sive centurias aliquot tarn auctorum, quam librorum Hebraicorum, Syriacorum, Arabicorum, vEgyptiacorum: addita mantissa Bibliotheeurum aliquot Europaearum,” 16.58, 4to. 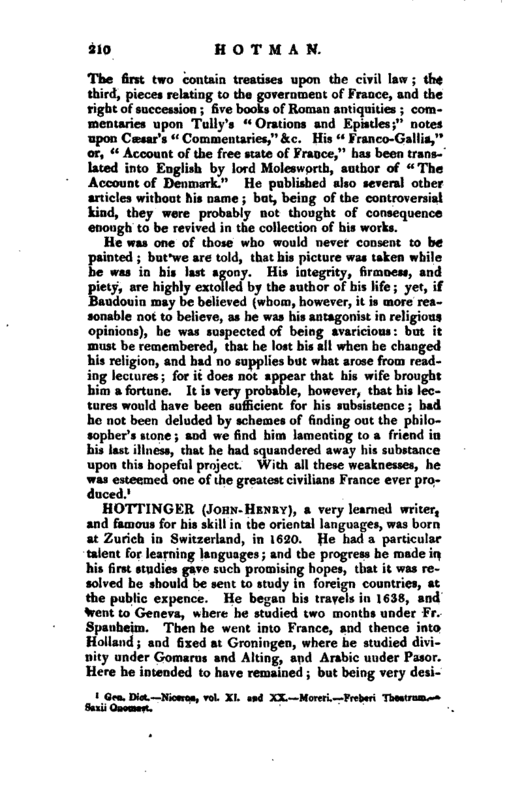 Baillet does not speak very advantageously of this work of Hottinger, whom he accuses of not being very accurate in any of his compositions: and indeed his want of accuracy is a point agreed on by both papists and protestants. 5. “Etymologicon Orientale, sive Lexicon Harmonicum Heptaglotton,” &c. 1661, 4to. The seven languages contained in this Lexicon are, the Hebrew, Chaldee, Syriac, Arabic, Samaritan, Ethiopic, and Rabbinical. 1 Gen. Dict. —Moreri. —Niceron, To!. VIII, Saxii Ooomastieoo. < Freheri Thealruoi.